Hydrogen Sulfide is a gas released by anaerobic bacteria found in nearly all water collection and treatment processes. It is corrosive, odorous, toxic, and contributes to the formation of acid rain. 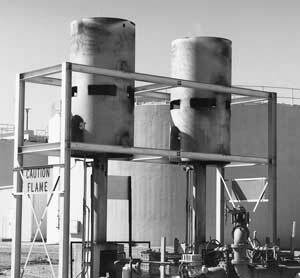 Acid rain is diminished using Marcab Company, Inc. Gas Purifiers to eliminate hydrogen sulfide before flaring. Biogas produced in anaerobic digesters typically includes concentrations of hydrogen sulfide from 40 to 4000 parts per million. Even greater concentrations have been observed. 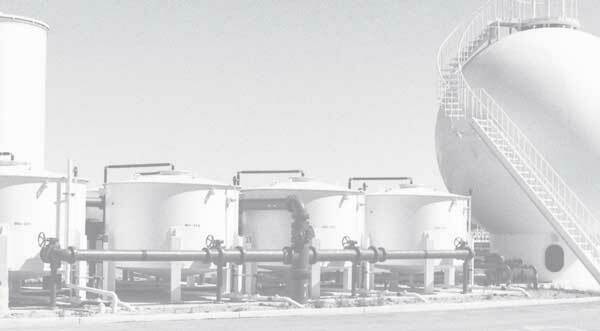 You will realize important benefits by removing hydrogen sulfide from your digester gas stream. Hydrogen sulfide reacts in gas processing equipment to produce sulfuric acid, a very damaging corrosive. Eliminating hydrogen sulfide from digester gas fueling internal combustion engines will extend engine life by reducing lubricating oil contaminants, particularly sulfuric acid. Boilers and other gas processing equipment will also benefit from the elimination of sulfuric acid derived from hydrogen sulfide. Eliminating hydrogen sulfide in the digester gas stream diminishes pollution and acid rain by reducing the formation of sulfur dioxide. Plant safety can be enhanced by curtailing personnel exposure to hydrogen sulfide; irritating at 5 ppm, toxic at 50 ppm, and deadly at 700 ppm.